Ok, so I loved this series, as you can probably tell from me putting it in my top fifty two things of all time. I read through it while I was in university, during a time when I wasn't reading much and had pretty much given up on my writing. A friend recomended it to me, explaining it as 'badass' if I recall - though I might be just saying that because I recently completed Mr. Torgue's Campaign of Carnage. The book is the globe spanning story of Kylar, a wetboy for the underground. With it's interesting take on magic, to its expansive history and future, the book is hard to put down. Dark and gritty terrifying in places, the Night Angel trilogy is both relatable and too fantastical for words. Kylar was an orphan, he comes from the street, he came from nothing and started training under the greatest Wetboy to ever live, a thoroughly mysterious man named Durzo Blint. You may be wondering at this point - considering my vague review - if I've actually read it. The answer is yes, but I read it four years ago. I remember it being a brilliant book where a young man takes the power he has and faces off against a god king, politics, a nation of darkness an actual god and, with the help of his friends and the allies he meets along the way, ultimately triumphs. It had a lot of interesting and cool characters, including the sarcasticly funny Ka'kari that only Kylar could hear. The Night Angel Trilogy is a fantasy series written by Brent Weeks. 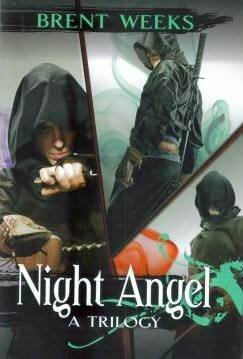 The story follows the life of Azoth (later Kylar Stern) as he struggles as a guild rat to become the ultimate wetboy (an assassin with magical talent, such as the ability to muffle sound or to block an attack), but then tries to leave it all behind and finally becomes the avatar of retribution: the Night Angel. It is well worth a read. Go buy it now.